Apache Corp fracking generosity on display in Balmorhea. Apache has secured more than 350,000 acres in Reeves County near Balmorhea, Texas and they plan to drill and frack 3,000 to 4,000 wells in this precious desert oasis. 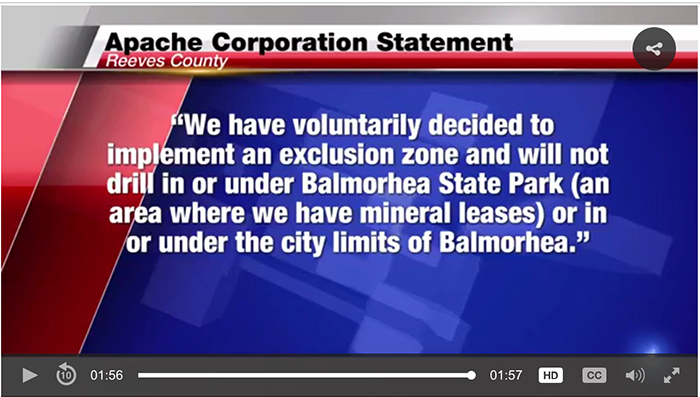 But, all the people who make Balmorhea their home and the ones who travel there to swim in the spring need not worry because because Apache Corp has excluded the city and park from fracking. Balmorhea State Park is 46 acres. How many acres is the town of Balmorhea? 100 acres? 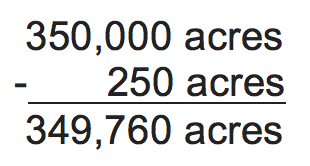 200 acres? Let’s be generous and say the tiny town of Balmorhea is 200 acres. 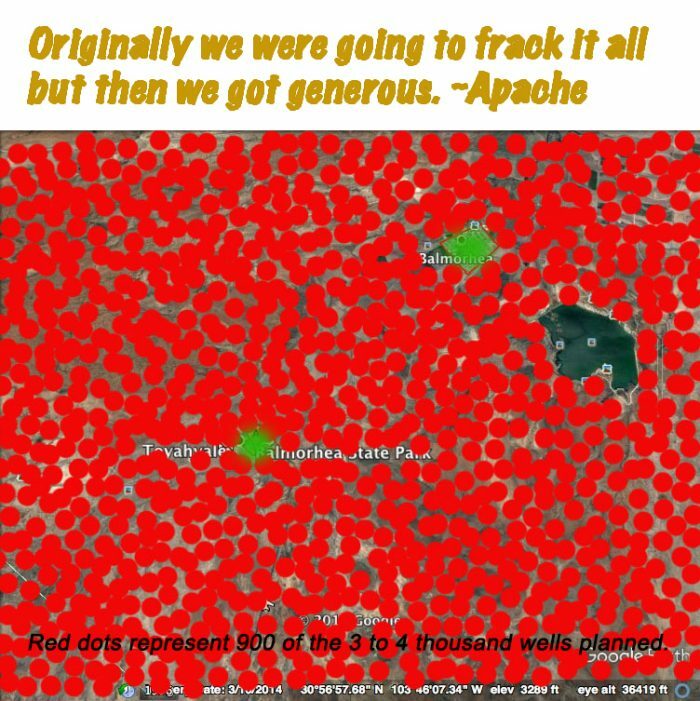 Apache Corp plans to drill and frack 3,000 to 4,000 wells in the precious desert oasis that is a beloved global tourist destination. But they are excluding the town of Balmorhea and the state park from fracking as stated above. Here are my back of a beer coaster calculations. 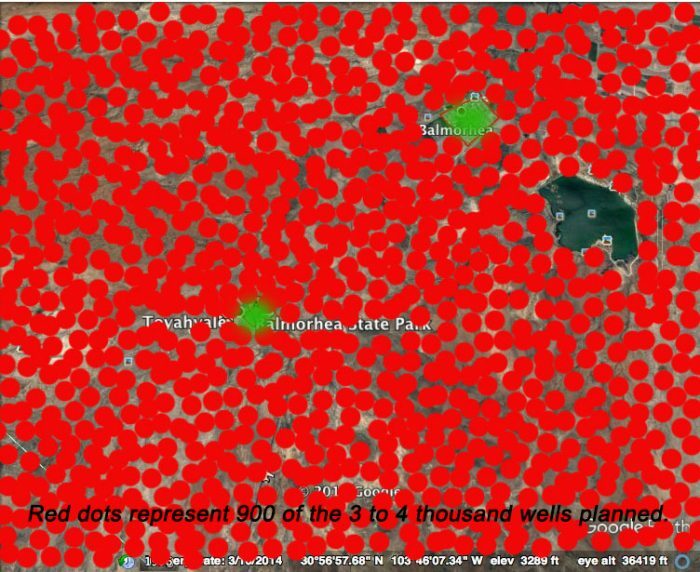 This is what those exclusion zones might look like when surrounded by only 900 wells, which are represented by red dots. This depiction does not include any of the other infrastructure that comes with this type of development such as processing plants, compressor stations, pipelines, mancamps, truck traffic, beer joints, strip clubs and etc. Apache Corp’s fracking generosity in Balmorhea will earn them billions in profit and forever change the face of a precious tourist destination. 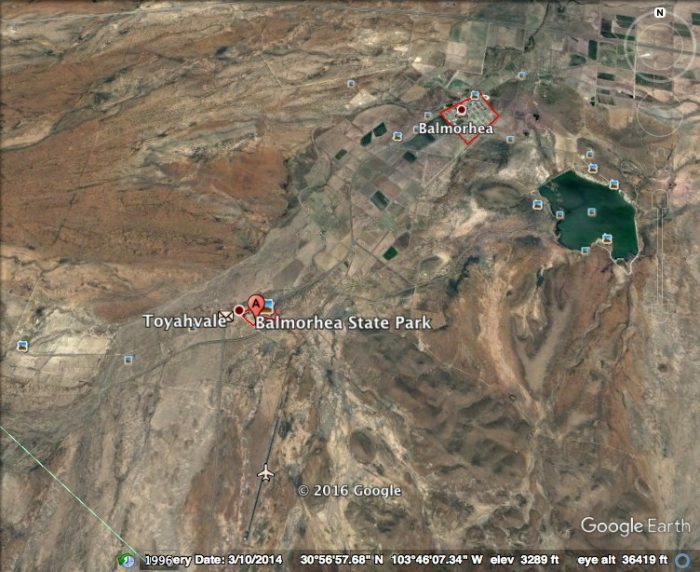 There is no other place on earth like San Solomon Springs and Balmorhea State Park but no one will vacation in a heavy industrial zone. Why should Texas voters and citizens that have overwhelmingly voted for fossil fuels and against climate change legislation be immune from common sense survival mechanism. Welcome to Trump’s world. The continuing slide into 3rd-world status for Texas. Exactly. We are on a downhill slide into 3rd world status.